I have repeatedly purchased from Historicalemporium.com since 2011 & have never been disappointed. Needed to return first pair of pants because of size. Got great info on best way to get replacement order in the fastest way possible. Excellent purchasing experience. I look forward to a future purchase. Terrific and well wear worthy material in these products! Very well made! accurate sizes and information provided on web site before ordering. Worry free experience. Very good. The waist coat is a tad snug but not bad. A button fell off on my first time of wearing but I retrieved it. The hats I purchased arrived in good condition and earlier than promised. My only quibble is about the fit. My hat size is 7 3/8. The website gave me choices S, M, L, etc. Large is slightly too large, but Medium would likely be too small. Showing size equivalents would have helped. Very nice , and good quality skirt. Will be perfect for my steampunk costume. I wear Western Emporium attire EVERYDAY. Doing so, I receive compliments and inquiries all day long at WALMART, KROGER, McD's, etc. Some inquire about the clothing source and I proudly mention your website. What I really like about Western Emporium attire are the pants. They are so very, very comfortable; especially since they are adjustable (unlike blue-jeans and tight-fitting waist belts). The shirts (because they are "puffy") do not cling to one's arms, back or abdomen like modern western shirts. This is a significant difference because they permit air-flow and a person remains cooler (especially in Texas summer heat!). Another advantage are the pockets. Because they are larger than modern pants, items within them do not rub a person raw AND those items are easily withdrawn when needed. 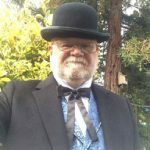 I've worn only Western Emporium " Old West" attire for two years and am sold on their products. I really enjoy the clothes and will be purchasing more items in the near future. I contacted the sales person and she answered all my questions accurately regarding size. Received my blouse and it fits beautifully. I had no problems or delays during the ordering or shipping of the items purchased.